Long exposure of the subway station Hasenbergl, opened in 1996 and serving line 2 of Munich's U-Bahn. English : Long exposure of the subway station Hasenbergl, opened in 1996 and serving line 2 of Munich's U-Bahn. English : Steam Czech locomotive ČSD Class 423.0 (Popelka) on lokal line between Stará Paka and Lomnice nad Popelkou, Czech Republic, 2005. English : Diving with Caribbean reef sharks (Carcharhinus perezii) in Nassau, Bahamas. Amphitheater of the ancient roman city of Italica, today municipality of Santiponce, near Seville, Spain. The amphitheater was built during the reign of emperor Hadrian (117-138) and, with a capacity of 25,000 spectators, was one of the biggest amphitheaters in the Roman Empire. Italica was the first roman city in Hispania and was founded in 206 BC by the great Roman general Publius Cornelius Scipio (later given the nickname Africanus) to settle his victorious veterans from the Second Punic War against Hannibal and the Carthaginians. English : Amphitheater of the ancient roman city of Italica, today municipality of Santiponce, near Seville, Spain. The amphitheater was built during the reign of emperor Hadrian (117-138) and, with a capacity of 25,000 spectators, was one of the biggest amphitheaters in the Roman Empire. Italica was the first roman city in Hispania and was founded in 206 BC by the great Roman general Publius Cornelius Scipio (later given the nickname Africanus) to settle his victorious veterans from the Second Punic War against Hannibal and the Carthaginians. English : Interactive architectural visualization using game engine Unreal Engine 4. English : Two Su-30SM fighters met and escorted strategic bombarder Tupolev Tu-160, which launched cruise missiles over the Mediterranean. Ball ice in Stroomi Beach, Tallinn, Estonia. English : Ball ice in Stroomi Beach, Tallinn, Estonia. English : A maize dish preparation by roadside vendor in Salem, state Tamil Nadu, India. Viborg Katedralskole, Viborg, Denmark was completed in 1926. Architect: Hack Kampmann (September 6, 1856 – June 27, 1920), born 160 years ago today. English : Viborg Katedralskole, Viborg, Denmark was completed in 1926. Architect: Hack Kampmann (September 6, 1856 – June 27, 1920), born 160 years ago today. English : Caterpillar of butterfly Red Admiral (Vanessa atalanta) combining nettle leaves with a silk thread. Parasol mushroom, Macrolepiota procera, Ukraine. English : Parasol mushroom, Macrolepiota procera, Ukraine. English : Shopping, Arts and Business Center "Stary Browar" – the center of commerce and art, built in November 2003, located in the center of Poznań, Poland. Andean flamingos (Phoenicoparrus andinus) in the Cañapa lake, Bolivia. The Cañapa Lake is an endorheic salt lake of a surface of 1.42 square kilometres (0.55 sq mi) located in the Potosí Department, southwestern Bolivia. English : Andean flamingos (Phoenicoparrus andinus) in the Cañapa lake, Bolivia. The Cañapa Lake is an endorheic salt lake of a surface of 1.42 square kilometres (0.55 sq mi) located in the Potosí Department, southwestern Bolivia. English : Time-lapses shot from the International Space Station, showing both the Aurora Borealis and Aurora Australis phenomena that occur when electrically charged electrons and protons in the Earth's magnetic field collide with neutral atoms in the upper atmosphere. Candidplatz, opened in 1997, is an U-Bahn station in Munich on the U1 line. English : Candidplatz, opened in 1997, is an U-Bahn station in Munich on the U1 line. Sunrise in Meenikunno Nature Park in the south-eastern region of Estonia. English : Sunrise in Meenikunno Nature Park in the south-eastern region of Estonia. English : Prague astronomical clock, "The Walk of the Apostles", Czech Republic. Germany, Sigmaringen Castle, view from north. English : Germany, Sigmaringen Castle, view from north. English : Small droplets of melted liquid gallium are step by step merged together. The pedestrian bridge on the campus of the University of North Texas in Denton, Texas (United States). English : The pedestrian bridge on the campus of the University of North Texas in Denton, Texas (United States). English : Big Buck Bunny - short computer animated film created by the Blender Foundation. Seller posing in a grocery and cosmetics shop in the April 9th 1947 Square, better known as Grand Socco, Tangier, Morocco. English : Seller posing in a grocery and cosmetics shop in the April 9th 1947 Square, better known as Grand Socco, Tangier, Morocco. 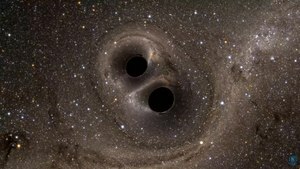 English : Video simulation of the view which would be seen by a close observer of gravitational waves - Universe object with number GW150914, showing the distortion of the star-field from gravity as the black holes orbit and merge. Pobiti Kamani, Bulgaria. Pobiti Kamani is considered the only desert in Bulgaria and one of few found in Europe and is a natural landmark in Bulgaria since the 1930s. The desert consists of sand dunes and several groups of natural rock formations on a total area of 13 square kilometres (5.0 sq mi). The formations are mainly stone columns between 5–7 metres (16–23 ft) high and from 0.3–3 metres (0.98–9.84 ft) thick. There are a number of theories regarding the phenomenon's origin. The pioneering hypothesis can be divided roughly into two groups: suggesting an organic (coral activity) or abiotic (prismatic weathering and desertification of the rocks, formation of sand and limestone concretions, or lower Eocene bubbling reefs) origin. English : Pobiti Kamani, Bulgaria. Pobiti Kamani is considered the only desert in Bulgaria and one of few found in Europe and is a natural landmark in Bulgaria since the 1930s. The desert consists of sand dunes and several groups of natural rock formations on a total area of 13 square kilometres (5.0 sq mi). The formations are mainly stone columns between 5–7 metres (16–23 ft) high and from 0.3–3 metres (0.98–9.84 ft) thick. There are a number of theories regarding the phenomenon's origin. The pioneering hypothesis can be divided roughly into two groups: suggesting an organic (coral activity) or abiotic (prismatic weathering and desertification of the rocks, formation of sand and limestone concretions, or lower Eocene bubbling reefs) origin. English : Explosion of small balloon filled with hydrogen. Interior view of the crossing of the Church of San Miguel, Jerez de la Frontera, Spain. The church is composed of 3 naves, where the central nave is higher than the lateral ones, with pillars decorated with gothic motifs and very diverse baldachins, whereas the altar is a work from 1609 by Juan Martínez Montañés 1609. The construction of the church began in 1484 due to a visit of the Catholic Monarchs to Jerez de la Frontera, but it took several centuries to complete, resulting in a harmonious mixture of elements from the late Gothic, Renaissance and Baroque. English : Interior view of the crossing of the Church of San Miguel, Jerez de la Frontera, Spain. The church is composed of 3 naves, where the central nave is higher than the lateral ones, with pillars decorated with gothic motifs and very diverse baldachins, whereas the altar is a work from 1609 by Juan Martínez Montañés 1609. The construction of the church began in 1484 due to a visit of the Catholic Monarchs to Jerez de la Frontera, but it took several centuries to complete, resulting in a harmonious mixture of elements from the late Gothic, Renaissance and Baroque. English : The walk through the centre of Amsterdam city, capital of Netherlands: Rijksmuseum, Van Gogh Museum, City center and Vogelpark. Aerial view of the "Owlman" aka "Astronaut", the most enigmatic geoglyph of the Nazca Lines, which are located in the Nazca Desert in southern Peru. The geoglyphs of this UNESCO World Heritage Site (since 1994) are spread over a 80 km (50 mi) plateau between the towns of Nazca and Palpa and are, according to some studies, between 500 B.C. and 500 A.D. old. Some theories assert that this 30 metres (98 ft) figure symbolizes an alien. English : Aerial view of the "Owlman" aka "Astronaut", the most enigmatic geoglyph of the Nazca Lines, which are located in the Nazca Desert in southern Peru. The geoglyphs of this UNESCO World Heritage Site (since 1994) are spread over a 80 km (50 mi) plateau between the towns of Nazca and Palpa and are, according to some studies, between 500 B.C. and 500 A.D. old. Some theories assert that this 30 metres (98 ft) figure symbolizes an alien. English : Royal Netherlands Air force Demoteam F-16AM flying aerobatics over Oulu Airport at Tour de Sky 2014 air show. Paraglider on the puy de Dôme in Auvergne, France. English : Paraglider on the puy de Dôme in Auvergne, France. English : Audio recording of Chanson d'automne, a poem of Paul Verlaine, interpreted by Arnaud Sottiaux and recorded by Thalie Envolée. Sol de Mañana (Morning Sun in Spanish) is a geothermal field in Sur Lípez Province, Potosi Department, southwestern Bolivia. The field extends over 10 square kilometres (2,500 acres) and is between 4,800 metres (15,700 ft) and 5,000 metres (16,000 ft) high. The area, characterized by intense volcanic activity, with sulphur spring fields and mud lakes, has indeed no geysers but rather holes that emit pressurized steam up to 50 metres (160 ft) high. English : Sol de Mañana (Morning Sun in Spanish) is a geothermal field in Sur Lípez Province, Potosi Department, southwestern Bolivia. The field extends over 10 square kilometres (2,500 acres) and is between 4,800 metres (15,700 ft) and 5,000 metres (16,000 ft) high. The area, characterized by intense volcanic activity, with sulphur spring fields and mud lakes, has indeed no geysers but rather holes that emit pressurized steam up to 50 metres (160 ft) high. English : Common myna (Acridotheres tristis) in Bangkok, Thailand. Olympiastadion Munich, located in the heart of the Olympiapark, at dusk. English : Olympiastadion Munich, located in the heart of the Olympiapark, at dusk. English : Överby kvarn is a still working windmill in Sollentuna Municipality, Sweden. The Royal Palace of Brussels is the official palace of the King and Queen of the Belgians in the centre of the nation's capital Brussels. However it is not used as a royal residence, as the king and his family live in the Royal Palace of Laeken on the outskirts of Brussels. The website of the Belgian Monarchy describes the function of the palace as follows: The Palace is where His Majesty the King exercises his prerogatives as Head of State, grants audiences and deals with affairs of state. Apart from the offices of the King and the Queen, the Royal Palace houses the services of the Grand Marshal of the Court, the King's Head of Cabinet, the Head of the King's Military Household and the Intendant of the King's Civil List. The Palace also includes the State Rooms where large receptions are held, as well as the apartments provided for foreign Heads of State during official visits. English : The Royal Palace of Brussels is the official palace of the King and Queen of the Belgians in the centre of the nation's capital Brussels. However it is not used as a royal residence, as the king and his family live in the Royal Palace of Laeken on the outskirts of Brussels. The website of the Belgian Monarchy describes the function of the palace as follows: The Palace is where His Majesty the King exercises his prerogatives as Head of State, grants audiences and deals with affairs of state. Apart from the offices of the King and the Queen, the Royal Palace houses the services of the Grand Marshal of the Court, the King's Head of Cabinet, the Head of the King's Military Household and the Intendant of the King's Civil List. The Palace also includes the State Rooms where large receptions are held, as well as the apartments provided for foreign Heads of State during official visits. English : Visualization of shipping routes in time period of years 1750 - 1854 : it shows about 100 years of ship paths in the seas, as recorded in hundreds of ship's log books, by hand, one or several times a day. The data source is a dataset of the Climatological Database for the World’s Oceans 1750-1850 (CLIWOC) project (European Union funded project, 2001-2003). Autumn leaf butterfly (Doleschallia bisaltide) Bali, Indonesia. English : Autumn leaf butterfly (Doleschallia bisaltide) Bali, Indonesia. English : Several moments from rugby match in Sunshine Coast Rugby Union between University and Nambour Toads, Australia. Losiny Ostrov National Park in Balashikha, Moscow Oblast, Russia. English : Losiny Ostrov National Park in Balashikha, Moscow Oblast, Russia. English : Hawksbill sea turtle (Eretmochelys imbriocota) feeding on soft corals at the island Ko Tao, Thailand. English : A Belarussian engineer and transport designer Anatoly Yunitskiy talks about pollution problems and offers a project of orbital ring that would allow to move the industry to space in comparison with traditional space rockets. He also talks about his main invention - a string rail transport technology (Sky Way) and its advantages in comparison with traditional rail and road transport. Panoramic view of Chuquicamata, a state-owned copper mine located at 2,850 metres (9,350 ft) above sea level just outside Calama, north of Chile. It is by excavated volume the largest open pit copper mine in the world. The huge hole was started in 1882 as a mine to extract gold and copper. It is 4.5 kilometres (2.8 mi) long, 3.5 kilometres (2.2 mi) wide and with a depth of 850 metres (2,790 ft) it is the second deepest open-pit mine in the world (after Bingham Canyon Mine in Utah, USA). English : Panoramic view of Chuquicamata, a state-owned copper mine located at 2,850 metres (9,350 ft) above sea level just outside Calama, north of Chile. It is by excavated volume the largest open pit copper mine in the world. The huge hole was started in 1882 as a mine to extract gold and copper. It is 4.5 kilometres (2.8 mi) long, 3.5 kilometres (2.2 mi) wide and with a depth of 850 metres (2,790 ft) it is the second deepest open-pit mine in the world (after Bingham Canyon Mine in Utah, USA). English : According the Newton's theorem of revolving orbits the planets revolving the Sun follow elliptical (oval) orbits that rotate gradually over time (apsidal precession). The eccentricity of this ellipse is exaggerated for visualization. Most orbits in the Solar System have a much smaller eccentricity, making them nearly circular. The Alte Bibliothek (Old Library) at Bebelplatz in Berlin-Mitte was built for the Royal Library of Prussia in 1775-1780 in the Baroque style. It is also being called "Chest". English : The Alte Bibliothek (Old Library) at Bebelplatz in Berlin-Mitte was built for the Royal Library of Prussia in 1775-1780 in the Baroque style. It is also being called "Chest". English : View on and from Gibraltar Cable Car from March 2016, Gibraltar. Hotel Restaurant Aux Gorges du Chéran and west view of the Saint-Jacques Towers on the Semnoz in the background, from the pont de l'Abîme in Cusy, France. English : Hotel Restaurant Aux Gorges du Chéran and west view of the Saint-Jacques Towers on the Semnoz in the background, from the pont de l'Abîme in Cusy, France. English : Time lapse sequences of lanscape with moving clouds captured in northern and southern Utah, USA, between 2010 - 2013. Struthio camelus (ostrich) skeleton prepared using the bone maceration technique and on display at the Museum of Veterinary Anatomy FMVZ USP. English : Struthio camelus (ostrich) skeleton prepared using the bone maceration technique and on display at the Museum of Veterinary Anatomy FMVZ USP. English : Southern brown kiwi (Tokoeka) Apteryx australis feeding in manuka at Mason Bay, Stewart Island (Rakiura), New Zealand. Oktoberfest is the world's largest Volksfest (beer festival and travelling funfair). Held annually in Munich, Bavaria, Germany, it is a 16-day folk festival running from mid or late September to the first weekend in October, with more than 6 million people from around the world attending the event every year. Locally, it is often called the Wiesn, after the colloquial name for the fairgrounds (Theresienwiese). The Oktoberfest is an important part of Bavarian culture, having been held since 1810. Other cities across the world also hold Oktoberfest celebrations that are modelled after the original Munich event. In 2016, Munich Oktoberfest is taking place from September 17 to Oktober 3. English : Oktoberfest is the world's largest Volksfest (beer festival and travelling funfair). Held annually in Munich, Bavaria, Germany, it is a 16-day folk festival running from mid or late September to the first weekend in October, with more than 6 million people from around the world attending the event every year. Locally, it is often called the Wiesn, after the colloquial name for the fairgrounds (Theresienwiese). The Oktoberfest is an important part of Bavarian culture, having been held since 1810. Other cities across the world also hold Oktoberfest celebrations that are modelled after the original Munich event. In 2016, Munich Oktoberfest is taking place from September 17 to Oktober 3. English : Demonstration video of the Levitron, levitating top device which partially explains its reliance upon the principle of spin stabilized magnetic levitation. A phenomenon discovered in the late 1970's by Roy M. Harrigan. Dome and crossing of the Roman Catholic church and Monastery of St. Francis, Quito, Ecuador. The monastery complex, the largest architectural ensemble among the historical structures of colonial Latin America, was completed in the 16th century. Construction took 150 years, and the building exhibits a mixture of architectural styles. English : Dome and crossing of the Roman Catholic church and Monastery of St. Francis, Quito, Ecuador. The monastery complex, the largest architectural ensemble among the historical structures of colonial Latin America, was completed in the 16th century. Construction took 150 years, and the building exhibits a mixture of architectural styles. English : Painted lady butterfly (Vanessa cardui) on birdeye speedwell (Veronica persica). Filmed in Johoku-Chuo Park, Itabashi-ku, Tokyo, Japan on 27 February 2016.